Base Reuse News Is Stirring Up Again. Now that the debate over aviation use versus other uses appears to be settled. What suggestions for the disposition of the N.A.S. WillowGrove facility? Your Opinion Is Welcome Here!!!! Here you will have an opportunity to voice your opinions concerns and ideas about what to do with the land and how the process is being handled by local committees and government. This is a public forum to post the latest developments news and to share ideas and discuss them so that our voices may be heard and our concerns addressed. All points of view welcome!! Many Comments have been made About ReuseTheBase and are now located here on the About Page As This Page was getting very conjested with comments. Thank all of you for your input and ideas. Feel free to register and start your own posts under concerns and ideas or anywhere that seems appropriate. All registered users are contributers to this site Thank You! Horham Township Authority for NAS-JRB (HLRA). 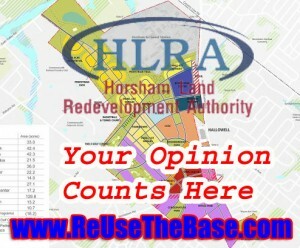 The Horsham Township Authority for NAS-JRB (HLRA) was first formed by Horsham Township Resolution 2005-26 on October 12, 2005. On November 7, 2005 by Ordinance the Authority was authorized to file of Articles of Incorporation under the provisions of the Municipality Authorities Act.